If there’s one thing that practically all car owners have in common, it’s a desire to get rid of all those weird smells that tend to accumulate inside their vehicle. Help your car wash customers enjoy fresh-smelling automobiles with our collection of car air fresheners. A can of air freshener is really easy to use. All you need to do is open it up, leave it in a convenient spot, and the product naturally absorbs foul odors in the area and fills the air with pleasant smells. You can purchase a variety of car scent cans and related products online from Superior Car Wash Supply at wholesale prices that can't be beat. 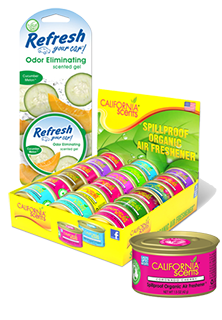 Our inventory includes Scentique, Scent Bomb gel disks, California Scents & Little Trees can air fresheners, Citrus Magic auto air fresheners, and Pure Citrus air freshener cans. Bulk buy these products and save!